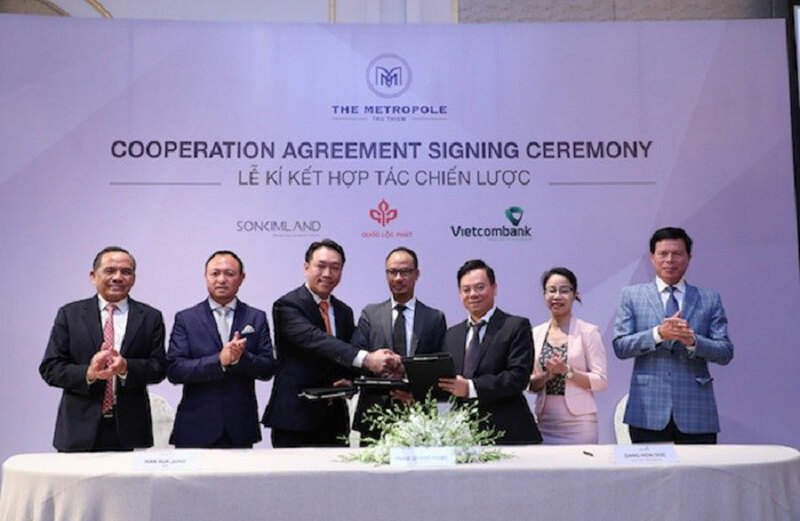 Loc Phat Company and Son Kim Company (SonKim Land) and Vietcombank signed a strategic cooperation agreement, Officially kick off the Thu Thiem The Metropole Project in Thu Thiem New Urban Area. 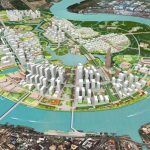 Thu Thiem urban area, located on the East bank of the Saigon River, has a total area of ​​657 hectares, is expected to become the center of finance and trade of international scale and is the largest urban area in Southeast ASIAN. In the new urban development plan, the integration to ensure the harmony of existing natural landscapes with architectural constructions has been carefully considered and has been adopted by the City, the Management Board The Thu Thiem area is meticulously planned with the advice of many prestigious international planning specialists. The Thu Thiem new urban area will be home to 145,000 people and will be the workplace for 217,000 workers, when completed will contribute to making Ho Chi Minh City a modern metropolitan of the region. This plan will also make Thu Thiem an ideal new destination for the creation of residential, commercial, and entertainment centers. Thu Thiem connects with all other centers of Ho Chi Minh City. Ho Chi Minh City through 4 bridges (Thu Thiem Bridge No. 1,2,3 and 4); a pedestrian bridge and Thu Thiem Tunnel. In particular, according to plan, Thu Thiem will connect directly with District 1 center, not only in transport but also in architecture, culture and shopping. Thu Thiem new urban area also has many similarities with the city of Sydney (Australia). Sydney is famous for its two architectural works, the Cono-Sydney Opera House and the Sydney Harbor Bridge. The road along the river stretches from Darling Harbor to the Opera House. Similar to Darling Harbor, Thu Thiem new urban area will be a unique urban area in Ho Chi Minh City connecting all old and new places within walking distance such as New City Opera House, Convention Center, Riverside Park. Bring the value of flawless life to the expectations of the residents. The Metropole Thu Thiem project will be developed on 4 land lots with a total area of ​​7.6 hectares, focusing on the high-end segment, in line with the objectives of the Thu Thiem New Urban Area Project. The design of the project is inspired by the quintessential designs of the Barangaroo area of ​​Sydney, East Circular Quay (Sydney), and will be localized to best fit the Vietnamese context and culture. 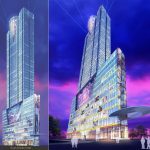 The Metropole Thu Thiem is promised to be a new destination for Saigonese people, especially for those who love urban lifestyle as attractive as in New York, London or Sydney. In addition, the project is designed to meet the criteria of sustainable development and energy saving. Loc Phat and SonKim Land consider this a top priority and determination to achieve during the project implementation. This strategic cooperation agreement will contribute to maximizing the strength of each Party in implementing and developing the project. Loc Phat is an investor of the project with strong financial strength as well as obtaining investment capital from foreign shareholders who have been approved by the governmental authority in due course of legal procedures and approval. land allocation, investment in the project and finalization of financial obligations for the land plots in the project. SonKim Land is the Project Developer. Vietcombank, which acts as a fund for the implementation of the project and guarantees the implementation of the project. Vietcombank is also the buyer of the project, providing affordable loans to buyers who need financial support. According to the affirmation of this “alliance”, the sale of the official only after the completion of the necessary procedures. 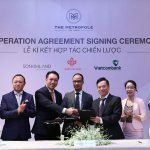 You are reading the article Loc Phat, SonKim Land and Vietcombank cooperate to develop the Thu Thiem project in the Real Estate category at https://realestatevietnam.com.vn/. Any information sharing, feedback please contact through Hotline 0909890897 (24/7) or email to info@realestatevietnam.com.vn. Increase the capital 3 times more, 3 more investors, SJC Tower project has finished?